Vegetarian Cookster: Can you spot the vegetarian chili? Can you spot the vegetarian chili? I raised awareness of yummy vegetarian food by placing SECOND in the chili cookoff hosted by my fiance's family Saturday evening. Wooooo! Out of seven entries, I placed second. Not too shabby! I certainly wasn't expecting to place, especially since all the tasters would be omnis. But, I asked his mom not to announce that the batch I made was vegetarian. I wanted people to try my chili with open minds and tastebuds... not turn their noses up to a veggie chili. I felt if they knew it was veg*n, it would automatically taste 'different' to them. 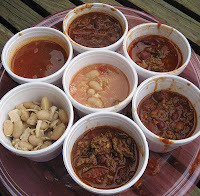 In fact, later that evening after the contest concluded, there were some latercomers who missed out on the top-choice chili because that part of the family had already left. When my fiance's mom indicated that my chili was still there and it was vegetarian, it was met with a less than enthusiastic response. "Sorry, I need my meat... I'm a carnivore." Yeah, whatever. Nevermind that my chili won a ribbon that evening, so it must be halfway decent. Go ahead and eat a less-than-stellar chili just because it has meat in it. To each their own, I guess. And so I continue my quest to educate people that vegetarian food can be yummy and appealing and absolutely wonderful! P.S.--I'm not sure which chili is mine in the photo. LOL It was made with Italian soy sausage so it pretty much looked like all the meat-based ones. Oh wow, congratulations! Way to represent the vegetarian voice!!! It's so annoying when people turn down food just because it's vegetarian, this just proves that veg food is fantastic, congrats! Seva Vegetarian Restaurant - Ann Arbor, Mich.